Crowning tools include tools that will cut various angles or contours at the muzzle of the barrel. The crown is important for accuracy, it needs to be concentric and square to the bore. Under this heading you will find a variety of crowning tools. Some are designed for use by hand, these tools will include a T handle. The remainder are for use with power tools or a lathe. 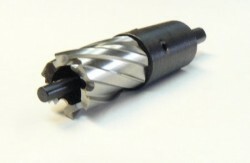 Interchangeable pilot crowning tool, 25-7mm caliber. Interchangeable pilot crowning tool. Work with calibers from 30-49. 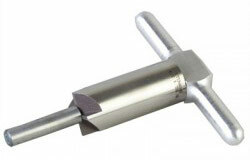 Interchangeable pilot crowning tool for calibers from 25-284 (7mm). 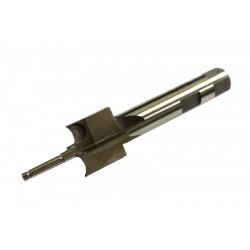 Interchangeable pilot crowning tool for calibers from 30-458 caliber. Annular Cutter* for reduction of muzzle diameter. Cuts 0.900″ max length, diameter down to 0.570″ x 1″ deep for 14x1LH as used on the SKS & AK pattern rifles or carbines. Threading dies rent separately. Also works for 9/16-24 muzzle threading. Threading dies rent separately. *Low RPM (250 RPM is Maximum) and lots of Lube, unless you want to replace the tool. Annular Cutter* for reduction of muzzle diameter. Cuts 0.900″ max dia. down to 0.570″ x 2″ deep for 14x1LH as used on the SKS & AK pattern rifles or carbines. Threading dies rent separately. Annular Cutter* for reduction of muzzle diameter. Cuts 0.900″ max, diameter down to 0.500″ x 1″ deep for use so you can thread the muzzle for a brake, 1/2×32 or 1/2×28 . Annular Cutter* for reduction of muzzle diameter. Cuts 0.900″ max length, diameter down to 0.630″ x 1″ deep for use so you can thread the muzzle for a brake, 5/8 x 32 or 5/8 x 24 equally as well.